Laura Dent's collection of handmade textiles are beautifully made with a wonderful imagination. Mermaids - and the occasional Merman - are signature pieces. She also makes fairies, which take on all sorts of themes, from 'day-trippers' to 'musical' or 'sewing' - she can make to any idea, and always with a host of decorative ideas and details which are quite stunning. She refuses to glue anything, so every item is drilled to enable her to sew it on. The style she adopts for her figures are anything but 'cute' - they all spring from the same pattern for face and body, then decorated accordingly. People call them 'mice' often, because of the shape of the nose - she wants to make them as things with a distinct character, and sense of humour. The mermaid is decorated with shells from our local beaches, ribbons and other pieces. Have a look through this short collection of mermaids and fairies. All have strongly wired limbs, and the mermaid tails, which can be bent to display as you wish. These are not toys, they are decorative items and as such can only be recommended to give to ages 4 and up. 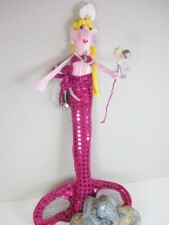 The mermaid is approximately 34cm tall.